Swanky is not the word. Practical. however, is very much its thing. 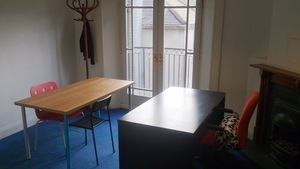 Having previously got some great tenants from Broadsheet here and here, We’re looking for some folks to share our city center office on Dame Street [Dublin 2] located just up from The Olympia Theatre. 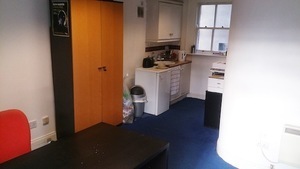 It’s a 3 room suite and the main room is currently free and can easily accommodate 2/3 people. 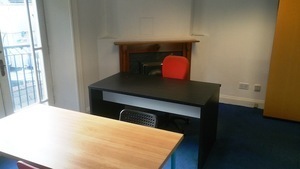 There are two other small rooms here which are currently occupied and the office has a toilet and kitchen facilities. The rent is €500 pm (plus bills which are negligible) and the room is available right now so to arrange to look drop an email to barryhartigan@gmail.com. Posted in Misc and tagged Office Share at 9:50 am on August 17, 2018 by Bodger. Multiple crying chairs of various sizes included? Could you define what you mean by “well-appointed” please? It’s got Feng Shui, obvs. So this ‘main room’ that’s available is actually part of the open kitchen? The Homeless on Dame st would love a place like this, but Capitalist scum have turned it into office space. Better Call Saul’s office at the back of the nail salon was better than this poo hole. You’d not be too inclined to bring your 2 or 3 clients round for a chat I’d say..
Would you object to someone putting in a bed? For commercial purposes obviously.